The software provides facility user can convert multiple excel file contacts to vCard format & also create a single file for each contact. Three vCard versions available, users can convert Excel file into vCard 2.1, vCard 3.0, and vCard 4.0. With the help of the tool, users can save the VCF file anywhere on the computer. The utility shows a real time conversion report of Excel to vCard process. vCard is a standard format used all over the world to store the information about a person in the form of contact. This information consists of Full name, Company name, Email ID, Phone numbers, Address, and many more. vCard file format is highly supported by various web-based email accounts as well as desktop email clients. A user is allowed to import and export the contacts from address book while working with this format. To transfer the Excel file to a computer user who wants to access it on mobile phones, and due to its high acceptability in various operating systems like iPhones, Windows, Android,Mac, etc. Step2. Select the Excel file to be converted by clicking on Browse button. The software lets you to preview the excel file after loading it. The software will show you the total items found in the Excel sheet as highlighted with red color at the bottom of the window. Step 3.Now hit the Next button in order to perform the conversion. Step 4. To map the Excel fields to vCard fields click on the dropdown menu given in Excel Fields option and select any of the listed fields. Step 5. Now map the selected Excel field with vCard field by selecting it from the dropdown menu provided within vCard Fields option. Step 6. You can add multiple fields by adding them one-by-one with the help of Add button provided in the software pane. All the mapped fields are listed under the Selected Fields column. Step 7. To remove any field, select the field and click on Remove button anytime. Step 8. After mapping all the fields, click the Next tab to proceed further. Step 9. If you want to export the empty email addresses, check the box given beside this option. Step 10. If you want to create a single vCard file for all the available contacts in Excel sheet, you must check this option. Otherwise, a separate vCard will be created for each individual contact. Step 11. Select the version of vCard. It should be same as the available version in which you are going to import the converted vCard file. Step 12. By default the vCard file will be saved on Desktop, but if you want to change the destination location click on the Change button. Step 13. Hit the OK button. The software starts the conversion process and shows the no. of empty email contacts, total no. of contacts and no. of added contacts as shown below. After completion of whole process, a dialogue box is opened that allow you to visit the destination folder. If you want to do so, click on Yes otherwise select No option as shown below. Now the process is completed and you can easily view the converted Excel contacts and proceed with the vCard file. 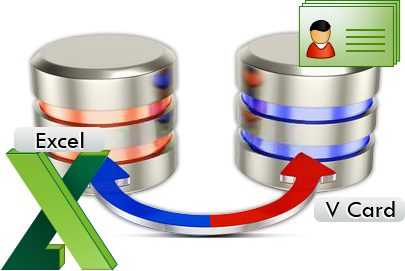 You can easily convert the Excel files into vCard format with the help of above explained procedure. Further, these vCard files can be used in various email applications. You can try the demo version also for analyzing its quality work but it can perform the conversion on limited number of files.